This is the first full month that the sites were live and they have made some great progress so far. Since it is the first month that the sites have been live this will be the first income report for those sites. I currently have two niche sites that I am working on and planning on starting another one in the very near future. I thought since I was seeing some early success with these sites that I would document everything so maybe it could inspire or help other people that want to learn more about building niche sites. Both of my niche sites were started around the beginning of April and started gaining serious traction in Google search engines with the help from my private blog network. I am not going to go into great detail about blog networks in this post as that is for another day. I just want you to know that this is my first attempt at having my own blog network and so far it has worked great for me. So if you don’t have a blog network yet don’t be discouraged, it is not as hard as you think to have your own. That is all I am going to say about blog networks for now. This site is in the outdoor activity niche and is monetized with Amazon. Currently the site only has around five pages and I will be looking to add some more content this month. As you can see from the chart above you can tell that the traffic picked up rather quickly and has continued to grow since. Again remember this is with only five pages of content and really on three pages that I am trying to rank for. I decided to include the earnings for April since I did make some sales near the end of the month. 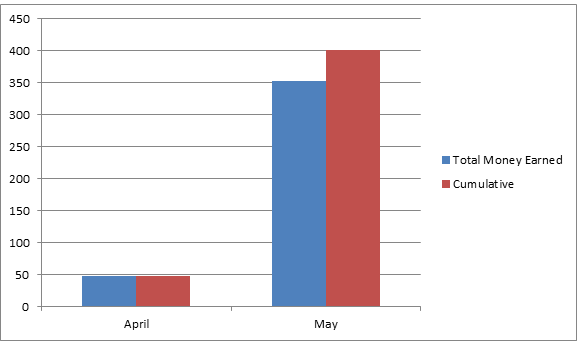 You can see that when the traffic increased in may so did the earnings. Total earnings from this site more than quadrupled from April to May. This is a great thing to see and hopefully the trend can continue into June. The second niche site is in the home improvement niche and this site has a lot more potential than the first site. The reason I say this is because there is a lot more room to expand with the content on this site. I can see adding around 100 pages of content at some point down the road. Currently it is only around 8 pages but I am looking to add more next month. 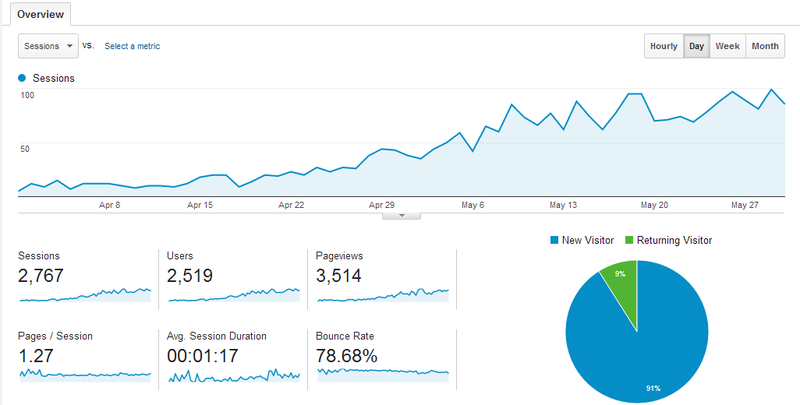 The growth curve on this site is similar but it peaked at around 100 visitors a day. I expect this site to start of slower than the other site but I wouldn’t be surprised if this site soon overtakes the other one in terms of traffic just due to the vast amount of long tail keywords. There were no earnings to report for in April so I will only be showing the earnings for May. This site still brought in a good amount of money even though only 14 items were ordered. This goes to show you that this site is selling much higher ticket items and if I can increase the traffic to this site the earnings could skyrocket. That does it for my first ever income report. Kind of makes me feel special having my own income report even though it is only a couple hundred dollars. I have followed the greats such as Pat Flynn and Spencer Haws when they post their income reports and it is a dream for my income reports to look like theirs one day. I will keep working hard and I look forward to building up my own audience. Thanks for taking your time to read through this income report and feel free to leave a comment below. That is some good earnings for such a new site. Thank you and I know! I have some high hopes for these sites and part of the early success of these sites is because of my PBN. Thanks for the comment. 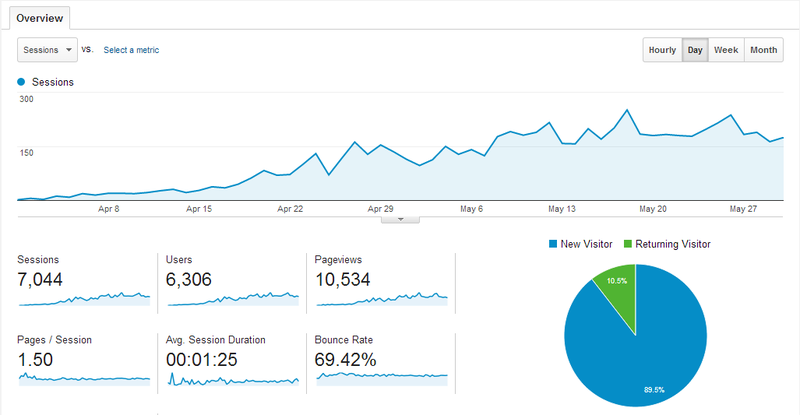 my daily visitors are still on 60, my niche site is ranking 8 …. but problem is the order its not converting very well… i have 93 amazon clicks but few orders…. I had the same thing happen to me when I first started my own sites, it took over 100 clicks before I even got my first sale. Pretty soon I started to sell more and more each day. I would just be patient and keep trying to get more visitors to your site. I was able to earn $8 from a $200+ product (my main product) at early or fewer traffic about 20 visitors a day, but now i have like 60 and 70+ visitors daily, im still earning but the product prices are like $14 and $18 ,, good thing is that they buy in 2 or 3 units … bulk buying ..